Forced air heaters are some of the most common types used in the United States of America. This is due to the fact that they are well suited for applications ranging from household heating to specific commercial, industrial and construction needs. This type of heater is preferred because of its ability to absorb, heat and recirculate cool air without introducing any additional moisture into the atmosphere. The efficiency of forced air heaters also make them extremely economical to use. At Precision Equipment, our focus is designing and manufacturing world-class forced air heaters for large scale industry professionals to use during extreme winter weather conditions. 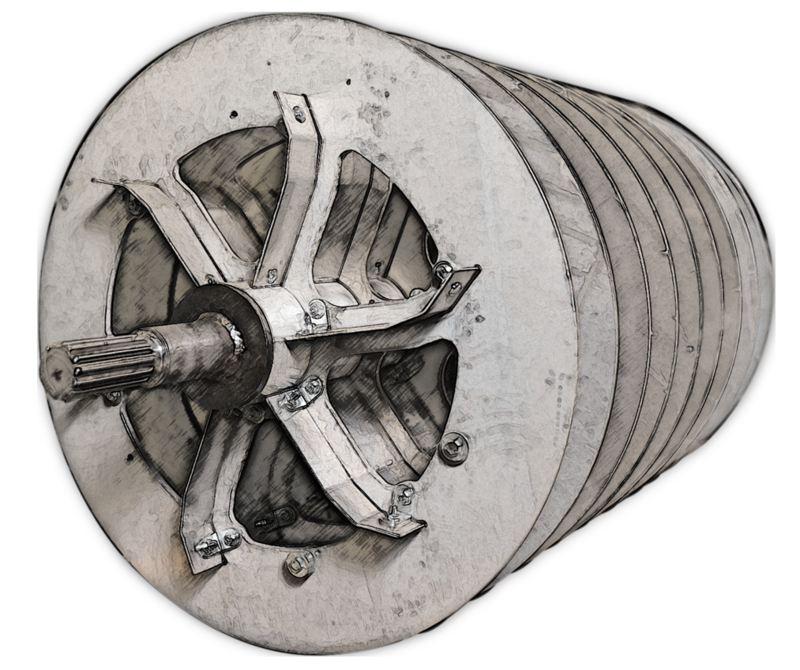 Our forced air industrial and construction heaters are design to provide steady, reliable heat in the harshest cold weather conditions. This makes it possible to be comfortable and efficient in order to carry out business as usual without encountering weather related setbacks. The revolutionary manufacturing and design process that each Precision Equipment heater goes through offers many unique benefits not found in products made by other forced air heater manufacturers. Clean Heat - A major advantage of our unique heater design is the clean energy it produces. The technology used in our heaters uses a non-ferrous disk spinning between two opposing magnetic fields. This process disrupts the eddy fields of the magnets causing resistance which makes a tremendous amount of clean and dry heat. The exhaust is also ran through an air to air heat exchanger which removes toxins like carbon monoxide and other by-products and contaminants from the airflow. The result is a dry heat that has no noticeable smell or fumes accompanying it. This makes our mobile magnetic heating design extremely environmentally friendly. High Efficiency Heating – The design of our indirect heaters also enhances the efficiency of the machines. With a computer controlled temperature gauge, you can conserve fuel while simultaneously selecting the precise heating levels for any project at your work site. Low Operating Cost – Features found throughout the design of our forced air heaters such as the automatic shutdown for high temperatures, circuit overload protestation, low fluid indicators and the built-in air shutoff contribute to their low operational cost by preventing damage and excessive wear on key mechanical and electrical components in the heaters. Optimal Safety – The flameless heat produced by Precision Equipment heaters enhance safety levels for all operators and crew members. A prominent emergency button, full fluid containment design and a built-in automatic air shutoff valve each assist with reducing the risk of an explosion while the machine is in operation. Electric trailer brakes ensure safety during transportation of the heater from one job site to another. Ease of Use – Our indirect fired portable forced air heaters are very easy to use with “set it and forget it” capabilities. With a state of the art digital control panel and a blinking LED indicator positioned prominently on the roof of each heater, it is quick and easy to determine the operating status of the machine at any point during use. Simple Maintenance – Our heaters are largely self-preserving, with several systems in place to help you to operate and monitor the machine. Each heater has automatic shutoffs that switch the machine off in cases where continued operation could lead to extensive and irreversible damage. Large service access doors located on the side of each heater also help to make the maintenance of the machines easier and more efficient. Long-Lasting Operation – The durable heavy-duty design of each indirect fired air heater along with the self-preserving features of our Precision Equipment machines allow you to enjoy up to 12 years of reliable commercial, construction or industrial magnetic heating. At Precision Equipment, our goal is to remain the leader in flameless forced air heating and portable indirect fired heater design. Serving a wide cross-section of industries, we design our heaters with reliability, efficiency and safety as our main focus. Built to produce the highest efficiency output capabilities, our flameless heaters are known for outperforming the competition at all levels. We also specialize in custom work for our clients including the engineering, design and manufacturing of indirect heating equipment.